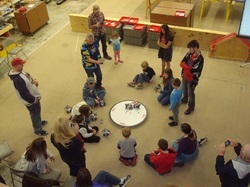 SuGO™ is the not-so-ancient art of building Sumo Wrestling Robots using LEGO MINDSTORMS. There are lots of different Sumo-bot formats, but SuGO™ was developed by our mentor Phil Malone when the Garrett Engineering And Robotics Society (GEARS) was first founded, back in 2006. "SuGO™ Sunday" began a 8 year tradition of monthly build 'n' battle events at the GEARS facility in Accident Maryland. If you are anywhere near Deep Creek Lake in Western Maryland then you MUST come and play SuGO™ with us. We play on the first Sunday of every month from 1:00 pm to about 4:00 pm. Don't bother bringing anything but your imagination (and cash for registration & snacks). We start by forming teams (these can be friends, family or even strangers) and then we build like crazy for 2 hours. The goal is to make the best Sumo Wrestling LEGO robot you can (while following the rules). Then we check-in the robots and have a knock-down double-elimination SuGO™ tournament. When it's all done, we break down the robots and everyone goes home with lots of ideas for next months event. These kids came out and had a blast, battling robots after they put some great thought into creating them, and also making great friends in the process. Even though we bring SuGO to many places, we do a lot of our outreach right here in our local community. 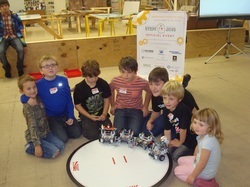 We do after school and summer workshop programs at many of our local schools and here at GEARS. We also bring SuGO to our local libraries, 4-H clubs, girl and boy scout organizations.